In this issue of PORTER : This issue PORTER embraces a spirit of optimism for the year ahead. 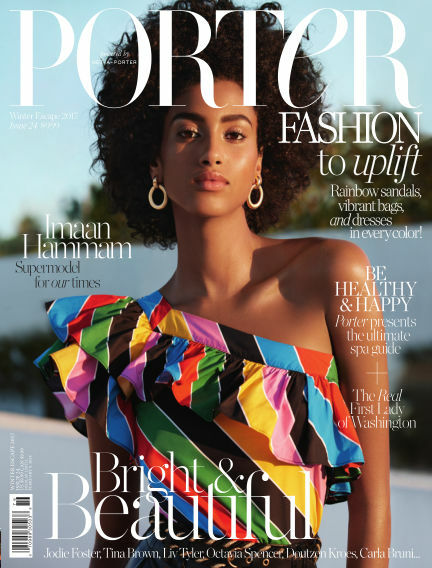 Our cover star Imaan Hammam encapsulates all the fun and sunshine of Winter Escape, in a cocktail of day-to-night partywear in Baja, Mexico. Of Moroccan and Egyptian descent, the Dutch model’s unique beauty, incredible energy and innate charisma bring to mind the original supers; she’s a poster girl for our times. If ever there was a story to stir the soul, it’s that of Katharine Graham – The Washington Post’s legendary publisher, who took down Nixon and smashed through every glass ceiling to become the most powerful woman in Washington. Plus, Hollywood’s queen of the indie screen and star of the award-winning Big Little Lies, Laura Dern talks men, politics and fearlessness. And Liv Tyler shares her life of domestic bliss and why she still finds solace in acting. The new resort collections are similarly vibrant. From bold day bags and luxe colorful pool slides, to rainbow heels and sunglasses in a spectrum of shades – these are must-have pieces that instantly brighten your mood. If you’re escaping, embrace the languid seduction of neutrals in lace, suede and macramé; and on your return, move through the city in relaxed tailoring with a casual urban edge. Look to PORTER’s spa special for inspiration to reset and reenergize the body and mind for the new year. Plus, we travel to Sweden’s Northern Lights; slow ski through the Dolomites; and down to the Arctic sea... A real winter wonderland. With Readly you can read PORTER (issue Winter Escape 2017) and thousands of other magazines on your tablet and smartphone. Get access to all with just one subscription. New releases and back issues – all included.